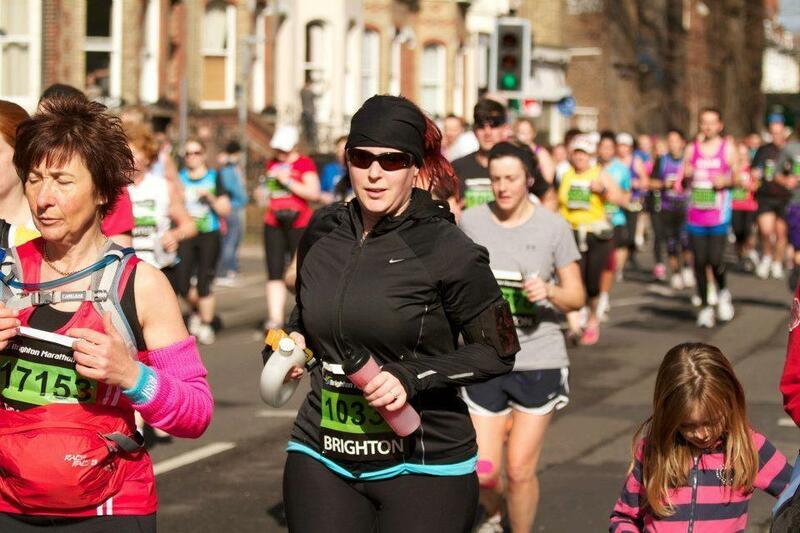 Last year I ran Brighton Marathon for Cancer Research UK. I trained for months, raised over £1200 and ran the full distance in 5 hours and 20-something minutes. It hurt. The race went on forerver, and I didn’t think the last 6 miles were ever going to end. I felt like I had been hit by a bus for days afterwards and it took me weeks to fully recover. I was very proud of myself but I decided I was never going to do another one again. So what happened? Well, after a quiet and uneventful January, after an amazing 2012, with a marathon, a wedding, an amazing honeymoon, a fab hen week, lots of work, a new boat… I was feeling a little bored, with not much to look forward to in 2013. 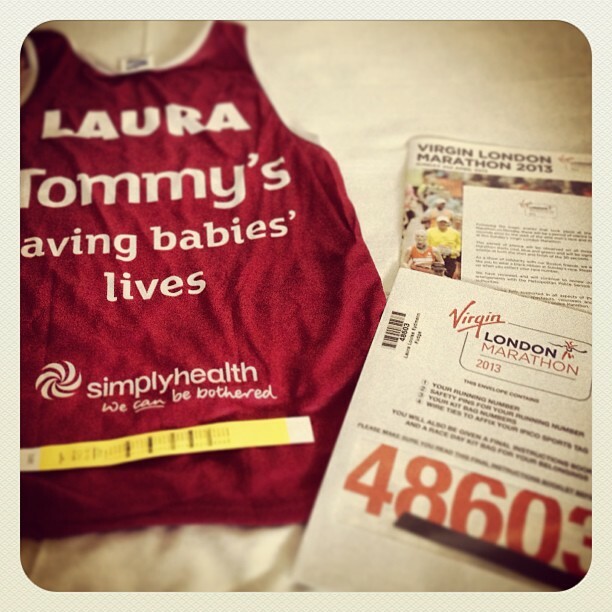 A friend of mine had signed up to run the London Marathon for Tommy’s a while back but had pretty much not done anywhere near enough training and was thinking of giving up his place. So, I thought, what the hell. I’ll do it. This winter and spring of 2013 has been cold. And wet, and windy, and even snowy. I have run in snow, hail and 30 mile an hour winds training for this marathon. It has been unpleasant to say the least… My training has been hampered by the weather, some days there were trees falling down around me (and in some cases literally in front of me) and I just couldn’t go out for fear of an accident. I had a flu-like bug which lost me a week of training, and then with 3 weeks to go, I fell down some stone steps, scraped and grazed both my knees, leaving big open sores, cut open my hand and bruised and twisted my right (and also weakest) knee. But it wasn’t all bad. I love running, and some days I got out there, and everything felt right, running through the back lanes, watching the world go by, and improving my stamina and speed… I live in a lovely area and the view is always amazing, which helps keep me going. I have a Nike+ watch which means my geeky side is always amused and satisfied by looking through the stats and data after a run, and sharing with others my achievements. On top of all the training, there has also been the fundraising element. It’s not been easy, raising £2500. I’m not there yet. I have an online donation page through Virgin Money Giving, I have left old school paper sponsorship forms at places where I work, get my hair cut, drink beer, and where other people I know work. 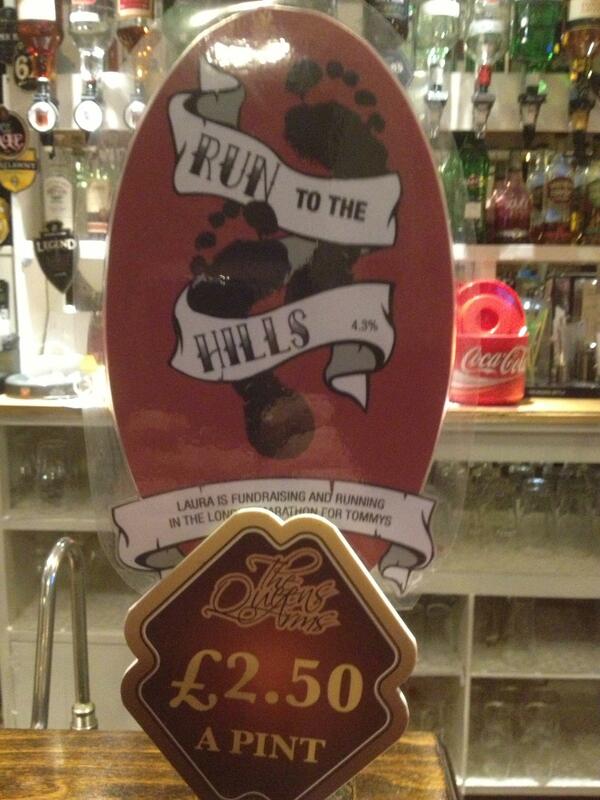 I have had fundraising events: my local Yacht Club held a quiz for me, with around 60 people in attendance, along with a raffle on the night, we raised £200; My local pub dedicated an entire barrel of beer for me, which we renamed “Run to the Hills”, I designed a beer clip for it and it went on sale for £2.50 a pint. It was gone in a few days, and we raised over £150 from it. 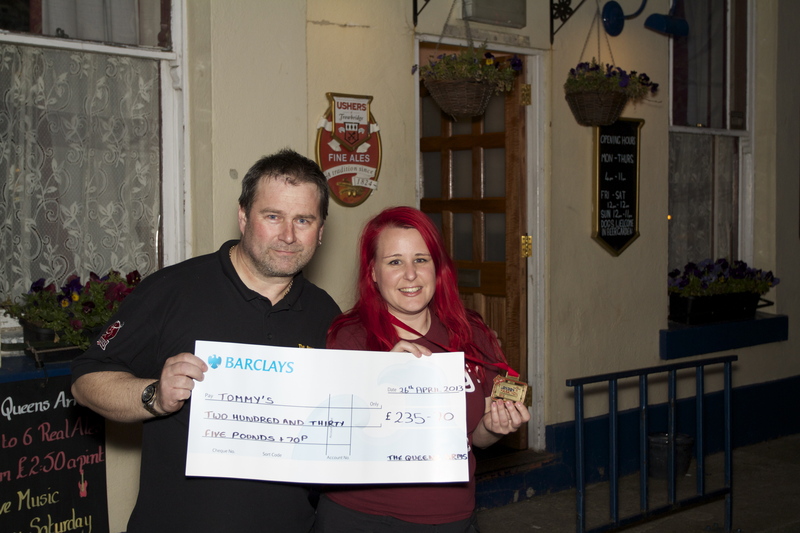 There was also a collection box in the pub next to the beer, which raised an extra £45 too. We are also planning a “Swap Shop” on Friday 3rd May at my local Hairdressers and Beauty Salon, where everyone comes along with old items of clothing that they don’t want, and swaps it with others. We are also holding a raffle on the night, and hope to raise over £100. It’s been hard work, I have asked everyone I know, on Facebook, in person and via email, and we are at a running total of around £1800 (although I have not been able to confirm final totals on all the forms etc. yet so it may well be more!). So, has it all been worth it? 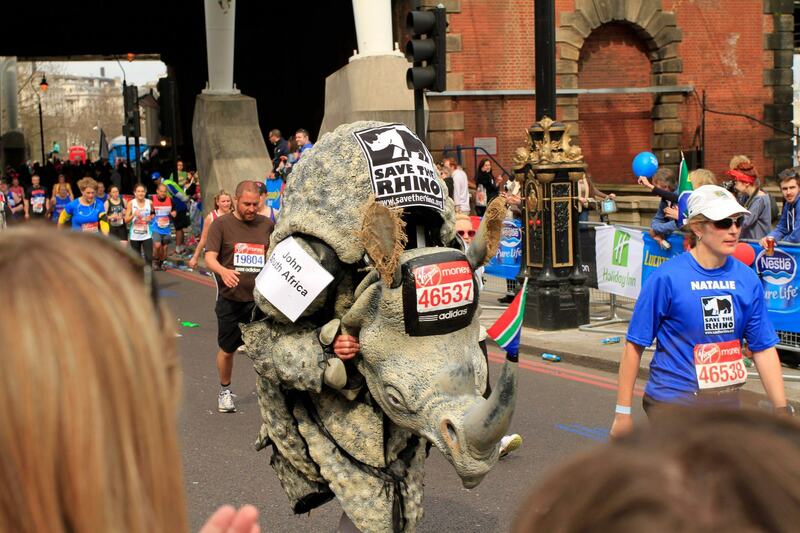 Was the Marathon amazing, worth all the hard work and training? Yes. The marathon fell on the second sunny day of the year, after months of freezing cold runs in the hail, snow, wind and rain, the weekend of the Marathon was gorgeous. 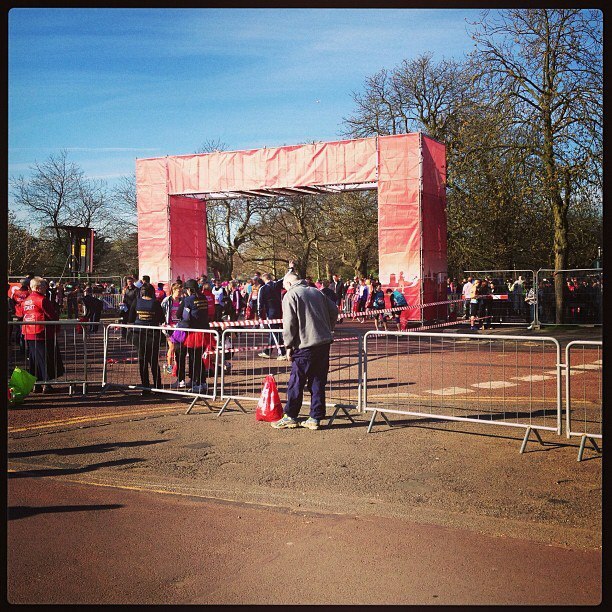 I was extremely nervous, and after waiting at the start for about an hour, it finally came to our start, and the 30 seconds of silence for the Boston Marathon. We were all wearing black ribbons and it was an emotional moment – absolute silence. All was going well, past the Cutty Sark and up to Surrey Docks, and then I needed the loo. The queues were pretty bad, but in the end I had to stop. After a brief toilet break, it was onwards and upwards and one of the best bits of the day… running across Tower Bridge. Awesome. By the Isle of Dogs, around 16 miles in, my knee started to ache and I was getting very tired. The next four miles were pretty tough, they seemed to go on for a long time, and there weren’t many crowds around here, so I didn’t have the added oomph of being cheered on. 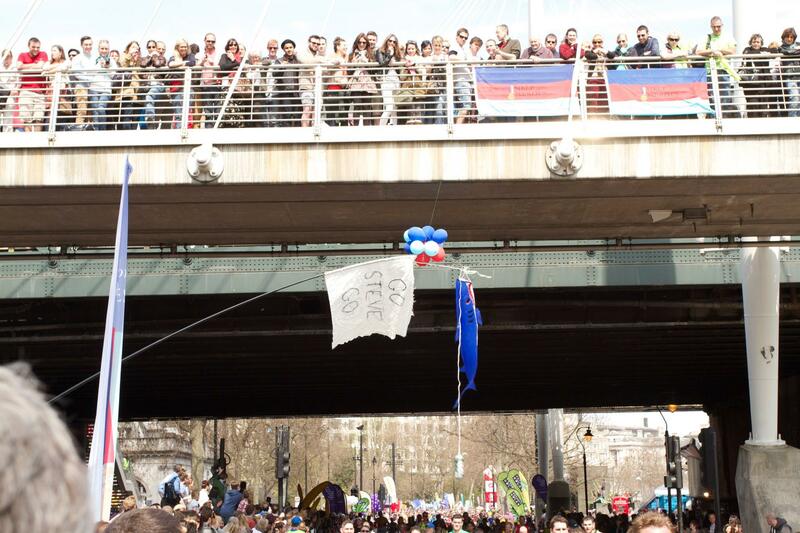 I had seen one of the Tommy’s cheering stations and it was brilliant – they shouted your name and cheered you on and really gave you a boost when you needed it most! 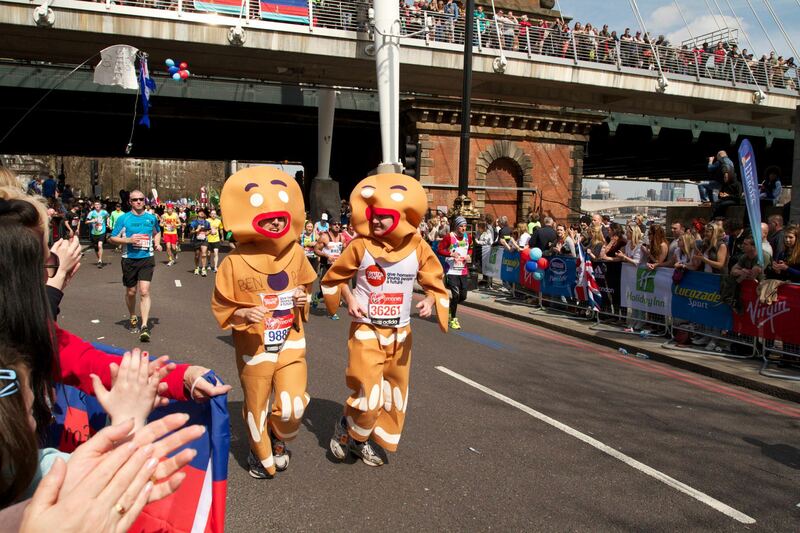 Before I knew it I was running towards Big Ben… and then St James’s Park and then the finish! I crossed the finish line, cried a little bit when I got my medal and then met up with friends for a well earned glass of red and a pizza… One of the best days of my life, well worth the pain and the hard work, and much more fun the second time round.